Personalized holiday stamps are perhaps amongst the most popular custom stamps, but you can also order custom stamps for other special occasions, such as birthday stamps, graduation postage stamps, and many others. Looking for a way to make your wedding invitations stand out? 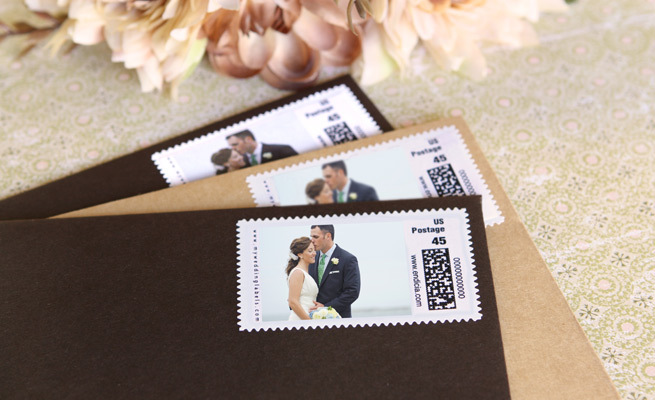 You can add a custom wedding postage stamp to make even the envelope of your letter unique. Custom postage stamps are not just for special occasions. You can use custom stamps to promote your business as well. Blank-looking envelopes are often tossed away by busy potential customers. With a custom stamp, your letters are sure to stand out immediately. Custom postage stamps are quite inexpensive and easy to order. And there are many online postage service providers that offer a wide variety of postage customization options. Make sure you browse through offers before deciding. Here are some of the best custom postage stamp service providers you can find online. You can compare and contrast their offers to find the one that truly suits your needs. Because there’s really no point in creating custom postage stamps if they’re not truly personal, regardless of whether you’re ordering them for your business or for personal use. These stamp customization services are recommended by the USPS on their official webpage about custom stamps. Zazzle.com offers 12 stamp denominations in 3 sizes and allows you to add your own image to any postage stamp. Of course, you can also choose from a generous image collection that includes photos from The Library of Congress and The Knot. Stamps.com offers a wide range of postage stamps solutions for individuals and businesses alike. They also allow you to create your own custom postage stamps using your own photos or images. You can also choose from their unique templates and designs. Read our article about the Stamps.com trial account and its benefits or go to photos.stamps.com for more info. The stamp customization services offered by Minted.com allow you to easily add text or textures on top of the picture you want on the stamp and offer more stamp shapes than previously mentioned services. Tinyprints.com is a very good place to start if you’re unsure about what you want from your custom postage stamp. They have a wide selection of presets and designs you can choose from to start creating your own unique stamps. Shutterfly.com offers a wide variety of customization options for mail, including personalized postage stamps. Their customers are quite pleased with the services, and they have a wide selection of customization options, so you’re bound to find something that suits your needs. Like Shutterfly.com, Evermine.com has an equally large selection of customizable items, including postage stamps. You can choose a custom stamp design from their library as a template, or send them your own text and image. Their stamps are available in two sizes, for small and large letters. Storkie.com is a very well-designed website that allows you to create customized postage stamps with your favorite pictures and illustrations. The diversity really is its strongest point, the second to best being its beautiful recommended designs for the winter holidays season! Where do you purchase your custom postage stamps from?